Read the following page to learn the proved way to clear IAS Preliminary Exam. It is not easy to qualify Prelims as there is very tough competition in this exam. Every year thousands of candidates fails just with difference of 3-4 marks. We have brought this exclusive Study Material, that will help you in scoring more marks than others. You can boost your score upto 160 marks with this Study Material. (Candidates needed only 106 marks to qualify Prelims in recent exam). UPSC Civil Services Preliminary Exam 2019 will be held on 2nd June 2019 (Sunday). The notification for Civil Services (Preliminary) Examination 2019 was released by UPSC on 19th February 2019. The Last date to apply for this exam was 18th March 2019. Around 4-5 lakh candidates are likely to apply for this exam. You have to prepare very strongly in such a way that you beat all others in this IAS Preliminary exam and qualify for IAS mains exam. The significance of Current Affairs in this prestigious Civil Services Examination is increasing every year. You can yourself judge by seeing the Question Paper of UPSC Civil Services Exam, both Preliminary and Mains, that majority of the questions asked are Current Affairs-oriented. It has now become IMPOSSIBLE to Clear IAS Prelims exam without giving due importance to Current Affairs. Gone are the days when people used to qualify this exam by reading just ONE FAMOUS Newspaper or Magazine. Don’t take risk of ignoring this section. Almost 40 to 50 Questions in IAS Prelims Exam are directly or indirectly related to Current Affairs. Therefore, you should prepare this section very thoroughly. It is very painful, when candidates fail to clear IAS prelims exam by just 2-3 marks in Prelims. We provide the Exact, Latest and Specific Current Affairs for IAS Prelims 2019 exam. We want to inform you that in IAS Prelims 2018 exam that was held on 3rd June 2018, there were around 36 questions, that came directly from our Current Affairs Course. (See Above Table: 2018 Performance). Similarly, in In IAS Prelims 2017 exam that was held on 18 June 2017, there were around 42 questions, that came directly from our Current Affairs Course. (See Above Table: 2017 Performance). This has become possible because we exactly cover those news and current affairs which are really important from Civil Services Examination point of view. Our Current Affairs Booklets are enriched with Top Quality and Best Content. Our coverage of News and Current Affairs is very wide. You may be reading just ONE or TWO Newspaper or Magazines for this exam. But we everyday refer more than 30 News Agencies, Official Government Sources, Newspapers, National and International Magazines. Every day, our team scans around 3000 news from different sources, so that you don’t miss any news that are important for IAS Examination point of view. 2. Limited Offer (for this month only): You will also get India Year Book 2019 Synopsis free. 3. 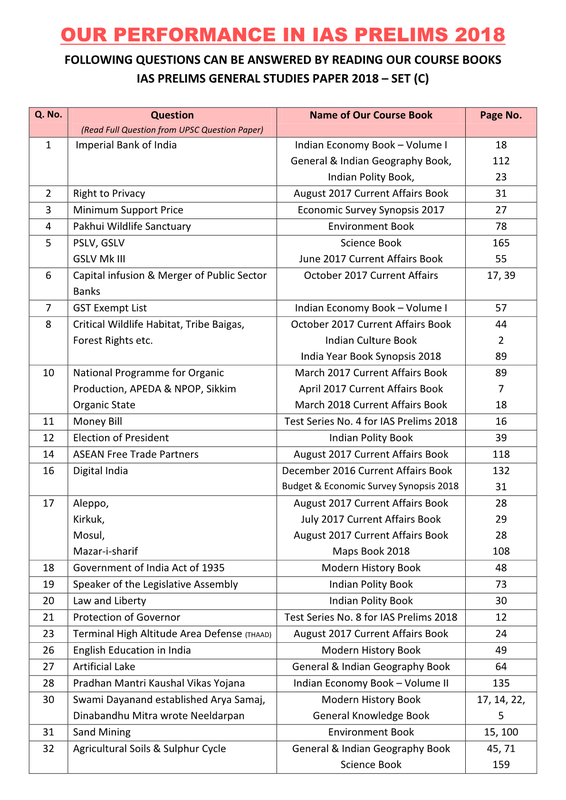 Limited Offer (for this month only): You will also get Budget and Economic Survey 2019 Synopsis free. We provide the All-Inclusive Advanced Course for Civil Services Preliminary Exam General Studies Paper-I. Our Booklets covers all the syllabus as mentioned by the UPSC in the notification. There is a very tough competition in UPSC Civil Services Preliminary Exam. Around 5 Lakh candidates appears in Prelims and out of them only 15,000 qualify for Mains. The actual reality is that 4,85,000 fails to qualify. Those who fails does not mean that they did not work hard or they did not read the standard well-known books. They failed as their preparation lacked the very-latest and focussed General Studies content (having Exact Orientation towards the Latest Trend of Questions being asked by UPSC). Those who read this focussed content score much more than others. For general understanding the basic and standard books are sufficient. But for competition you have to refer more than that. You have to prepare the all important topics while not ignoring the basic concepts. We provide the Exact and Relevant content for IAS Prelims Exam 2019. We are a pool of persons who have already qualified this exam many times. Intense efforts are put by our experienced team members to provide you the BEST coverage of all Topics: Conventional and Latest. All Latest Government Initiatives, Schemes, Programmes, Policies, Laws etc. are widely covered. All important topics in news relevant to this exam are widely covered. You may not find these important latest topics in general textbooks. These Booklets are fully updated and revised every year according to latest trend of questions being asked by UPSC. Each and every line of our books are important for this exam. Content-wise our Books are comprehensive but compact in terms of thickness. This makes it easier for you to read and revise these books frequently. Success in IAS Prelims depends on SMART books. Our SMART Books gives you clear understanding of the topics and also provides to some critical latest information that is missed in general books and Coaching Classes. Adopt SMART strategy and get success in this exam. We provide the two Volumes on Indian Economy & Financial System for IAS Prelims 2019 exam. It contains latest official facts & figures of Government of India and its various Initiatives in economy. There is general tendency among the candidates to focus only on reading and reading and they avoid practice tests. They think that they will practice Tests once they complete the full syllabus and in reality such a situation does not come. Practicing Offline Mock Tests like actual UPSC Prelims during preparation is vital for success in final exam. While it gives exposure to a candidate to face a real test like conditions prior to exam, it also keeps a candidate aware of his ability to grasp the information what he/she is reading. Most of the times, we keep on reading the books on a continuous basis. And during that process we may miss some of logical conclusions and facts. These strike in mind only when we take tests. There are lots of benefits of taking tests during your preparation especially for exam like Civil Services. Tests keeps you reminding about your performance. It helps you to read the content with more precision. Moreover it revises the syllabus on periodic basis. Appearing in IAS Prelims 2019 without practicing Tests is like participating in Olympic Games without practicing at home ground. In IAS Prelims, very narrow choices are given and you are asked to select one, two, three or all of them. Candidates who never took OFFLINE mock tests remain confused in selecting right option, even if he has read the asked information during study. Our mock test series for IAS Preliminary Exam 2019 are designed in such a way that it will develop a practice in you on how to select the right choice of answers. While it will develop a speed in you to solve the paper fast, at the same time it will help you in identifying the mistakes that you commit during tests. Therefore start with tests simultaneously with your preparation. We provides 20 Comprehensive Tests for IAS Prelims Exam 2019, right from July 2018 month and extended upto April 2019 month. All these test are based on UPSC Pattern. These tests will covers all areas like: Current Affairs, Economy, Polity, Biodiversity etc. Like UPSC Prelims, there will be 100 questions in each Test. They are designed in such a way to make you attain mastery in all important topics. Check demo of these tests at the end of this page. Explanation of these Tests and their answers are the most important part of these Test Series. All critical and relevant information about questions asked in tests are provided in these explanations. These answers and explanations will enhance your knowledge about latest events that are important from Prelims Exam point of view but are missed by most of the leading Newspapers, Magazines and Coaching Classes. Following are the 50 questions from our Test Series (2000 Questions) for IAS Prelims 2019 Exam. Don’t miss this mock test. You can check your preparation level by solving these questions. Answers and Explanations will be visible after the completion of this test. There are total 50 questions in this test. Each questions carries ONE mark. There is NO negative marking in this test for wrong answers. 1. Recently, the Indian government has announced the ‘Deep Ocean Mission’ to improve India’s position in ocean research field. Which of the following are the components of this mission? 2. Which of the following facts related to ‘Lake Chilika’ is/are CORRECT ? I. Chilika lake is a brackish water lagoon. II. Chilika Lake was designated the first Indian wetland of international importance. III. Chilika lake has numerous islands. 3. Which of the following are the measures of the ‘Economic Development’? 4. Which one of the following is the ‘Gas’ used in anesthesia by Doctors and Medical Professionals? 5. Apart from historic City of Ahmadabad of India, which of the following properties were inscribed on the World Heritage List in 2017 by UNESCO? 6. Which of the following are appointed by the President of India? 7. Constitution of India provides for disqualifications of the members of Rajya Sabha on many grounds. Who among the following is the final authority to decide if a Rajya Sabha member has become subject to any of these disqualifications other than Anti-Defection. Which of these are CORRECTLY matched? 9. Article 157 and Article 158 of the Constitution of India specify eligibility requirements for the post of governor. Which of the following are the requirements mentioned for Governor of State? 1. He should be at least 35 years old. 2. He should not be member of political party. 3. He should not be adjudged an insolvent. 4. He should be not be unfit to continue in office by infirmity of mind or body. 10. Which of the following are CORRECTLY matched? 11. The National Skill Development Mission was launched by Government of India to achieve the vision of ‘Skilled India’ and to create convergence across sectors and States in terms of skill training activities. Which of the following are the Sub-Missions under National Skill Development Mission? 12. Which of the following are the functions/role of ‘The National Institution for Transforming India’, also called NITI Aayog, formed on January 1, 2015 by Government of India? I. To foster cooperative federalism. II. To develop mechanisms to formulate credible plans at village level. III. To create a knowledge, innovation and entrepreneurial support system. IV. To maintain a state-of-the-art Resource Centre. 13. The joint exercise ‘DRUZBA 2017’ was in news recently. This military exercise took place between which of the following countries? I. Fiscal deficit indicates all borrowings by Government. II. Budget Deficit indicates government’s borrowings from RBI. I. The earliest Buddhist texts were passed down orally in Middle Indo-Aryan languages called Prakrits. II. After the rise of the Kushans, Sanskrit was also widely used to record Buddhist texts. III. The works of important Buddhist philosophers like Nagarjuna, Vasubandhu and Dharmakirti are generally termed as Tantras. Which of these above Statements is/are CORRECT? A. The people of the Indus Civilisation achieved great accuracy in measuring length, mass, and time. B. The people of the Indus Civilisation were among the first to develop a system of uniform weights and measures. I. Tropical Cyclones usually travel in groups or “Families” from the West to East. II. Tropical Cyclones are found in low latitudes over oceans. 18. Which of the following Birds Species is listed under the Schedule I of the Indian Wildlife (Protection Act), 1972? 19. Recently, United Nations Conference adopted the Treaty on the Prohibition of Nuclear Weapons. Which of the following are Prohibitions on Nuclear Weapons under this treaty? 20. Recently, Indian government has approved the setting up of ‘Startup Centers and Technology Business Incubators’ (TBIs) in India. Which of the following ministries are involved in these Centres? 21. Recently, the Union Cabinet of India has approved closure of which of the following centrally sponsored scheme? 22. The Reserve Bank of India is vested with the responsibility of conducting Monetary Policy. Monetary policy refers to the policy of RBI with regard to the use of monetary instruments under its control to achieve the goals specified in the Act. What is the primary objective of this Monetary Policy? I. A communication satellite usually operates from the Sun Synchronous Polar Orbit. II. A Remote Sensing satellite operates from a Geosynchronous orbit. 24. In year 2017, an Expert Group was constituted to study the objective criteria for allocation of resources to States and identification of beneficiaries under various programmes using Socio Economic and Caste Census (SECC) data. Who is the chairman of this committee? 25. Which of the following are the causes of sustained inflation in economy? 26. Indian government has approved new National Health Policy in 2017. Which of following are targets under this policy? 27. Which among the following is the landlocked country? 28. Niti Aayog has released ‘The Three Year Action Agenda’ to fasten the pace of development in India. Which of the following are its targets? 29. The India Institute of Technology has setup a network of 100 earthquake sensors as part of an exercise to provide an alert in case of any high magnitude earthquake occurs. In which State these earthquake sensors has been setup? I. This concept was first recommended by Urjit Patel committee Report. II. SDF will disallow the RBI to absorb surplus funds from banks without collateral. III. SDF will replace the Market Stabilization Scheme. Which of these statements about ‘Standing Deposit Facility’ (SDF) is/are CORRECT? 31. The Millennium Development Goals (MDGs) are the eight international development goals that had been established following the Millennium Summit of the United Nations in Year 2000. Which of the following ‘Millennium Development Goal’ is related to ‘Child Mortality’? 32. The first DNA Bank for Wildlife Species in India is being setup at which of the places? I. Prime Minister by default is the Leader of the House in Lok Sabha. II. Prime Minister can nominate another minister as the Leader of the House. I. Placement in Schedule VI of the Act provides for regulation in cultivation of a specified plant and restricts its possession, sale and transportation. II. Schedule V of the Act includes the animals which may be hunted. 35. Which of the following cities/places are situated on Brahmaputra River? 36. Which of the following are the instruments that are used for implementing monetary policy by Reserve Bank of India? 37. Which of the following departments/organisations/bodies are headed by the Prime Minister of India? 1. The Government of India is the issuing authority of coins. 2. The Reserve Bank is the issuing authority of notes. 39. Recently, the Union government has declared the entire State of Assam as a “disturbed” area. According to The Disturbed Areas (Special Courts) Act, 1976 once declared ‘disturbed’, the area has to maintain status quo for a minimum how many months? 40. The Cholas Kings patronised ‘Paintings’ during their time with great devotion. The most important of Chola-era paintings are found in which of the following temple? I. Attorney-General of India has the right to take part in the proceeding of Rajya Sabha. II. Attorney-General of India has the right to take part in joint sitting of the Lok Sabha and Rajya Sabha. 42. Which of the following Statements about the Regulating Act of 1773 is/are INCORRECT? I. This Act permitted the East India Company to retain its power in India but its management was brought under British Government. II. East India Company’s political functions were differentiated from its commercial activities. III. This Act prohibited the servants of company from engaging in any private trade. IV. It redesignated the Governor-General of Bengal as the Governor-General of India. I. It will be a physical reserve of 200 metric tons of low enriched uranium. II. It will be located in Kazakhstan. III. Uranium will be provided only for nuclear-based power plants. IV. Non-IAEA member states can also take uranium from this bank. 44. Which of the following are the Kharif Crops? I. The Nilgiri Biosphere is an International Biosphere Reserve. II. The Nilgiri Biosphere Reserve is situated in the Eastern Ghats. III. The Nilgiri Biosphere Reserve covers area of Two States. IV. Tamilnadu has the largest area under Nilgiri Biosphere Reserve. 46. Which of the following mobile wireless networks aims to acquire Space Roaming? 47. Recently, ‘JIGYASA’ a Student- Scientist Connect Programme was launched by the Indian government. Which of the following organisations is NOT involved in this Programme? 48. Enforcement agencies have discovered the increasing poaching of ‘Big Monitor Lizard’ (genus Varanus) in India. Which of the following Statements with regard to this species is/are CORRECT? I. These are found in fresh water lakes in the country. II. They are a Schedule IV species as per India’s Wildlife Protection Act, 1972. 49. Recently, Kidambi Srikanth of India clinched Australian Badminton Open Super Series title in Sydney. Which of following player was defeated by him in finals? I. No Court can issue the order for the arrest or imprisonment of Governor during his term of office. II. No criminal proceedings can be started against the Governor in any court during his term of office. Ques: If I subscribe the Course today, in how many days will I get the books? Ans: Books are dispatched same or very next day of your subscription/order. Ques: Do I need to read other sources for Current Affairs too? Ans: No, if you have subscribed our Course, there is no need to refer anything. We are covering everything. You don’t even need to spend precious time on daily Newspaper. Ques: Is your General Studies Books sufficient? Should I need to read some extra books? Ans: There is no need to read and refer anything outside our Course Booklets. We provide all the necessary information required to clear this exam in our General Studies Books. Ques: Can I get your course by Cash-on-Delivery? Ans: Yes, we provide All-India COD facility. There are Rs.100/- extra charges. We recommend “Online Payment” to get the books faster. Cash-On-Delivery Parcels take more time to reach as they are manifested several times during their journey towards destination. Ques: Can I pay in installments to subscribe your Course? Ans: No, you have to make the full payment in the starting to subscribe our course. Ques: Can I change the address later and get the remaining books at my new address? Ans: Yes, you can change your address. Please see our dispatch schedule and intimate us prior to dispatch by phone/email/sms. Ques: In which Medium/Language this course is provided? Ans: This Course/Study Material is provided only in ENGLISH medium/language. We do not provide it in Hindi Language/Medium. Ques: Can I have the Sample of Notes to Download? Ans: Yes. Download the Free Current Affairs PDF from this link. 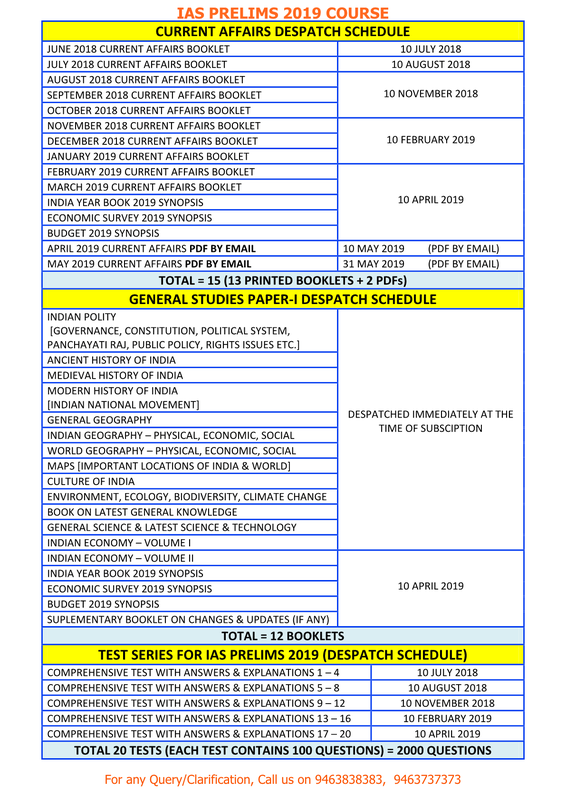 Download General Studies Notes PDF for IAS Prelims from this link.